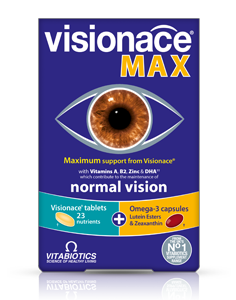 Visionace is a research based formula that has been developed with Vitabiotics' experts. 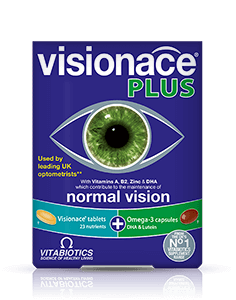 Visionace Original contains 23 micronutrients including vitamins A, B2 and zinc which contribute to the maintenance of normal vision, plus Bilberry extract and Lutein Esters. Visionace contains all the nutrients found to be helpful in the AREDS study (Betacarotene, vitamins C and E, zinc and copper), plus many others. Visionace can be used by contact lens wearers or those working long hours at a computer screen. Vitamin A, riboflavin (vitamin B2) and niacin (vitamin B3) help to maintain normal mucous membranes. The conjunctiva is the thin delicate mucous membrane that covers the front of the eyes and also lines the insides of the eyelids. Visionace Original contains vitamins C and E plus minerals zinc and selenium which contribute to the protection of cells from oxidative stress. Over the years it is important to reduce the exposure of the retina and the lens from UV light, smoke and pollution. As well as vitamins A, B2 and zinc which contribute to the maintenance of normal vision, Visionace Original contains vitamin B1, riboflavin (vitamin B2), B6, C, niacin (vitamin B3) and copper which contribute to the normal functioning of the nervous system. The retina contains one of the highest concentrations of zinc and Visionace Original provides 150% of the recommended daily allowance. Visionace Original is suitable for vegetarians and contains high quality natural Lutein Esters. Visionace also contains a comprehensive range of vitamins, minerals and nutrients, such as copper and selenium which support the normal functioning of the immune system, and thiamin (vitamin B1) which contribute to the normal function of the heart. An additional multivitamin is not required. Visionace is available from Boots, Superdrug, Holland & Barrett, supermarkets and health stores. Alternatively you can order online here.